Variable refrigerant flow technology has been available since 1982 when Daikin, a company from Japan which specializes in air conditioning invented it and the first to launch it commercially. 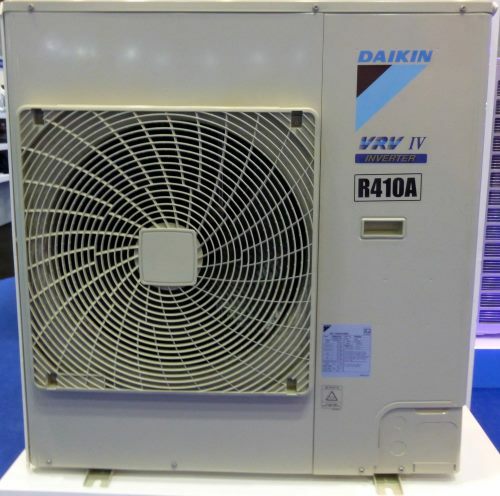 Daikin named this technology VRV or variable refrigerant volume and has the copyright of this name. This name is still being used today. Since then, other companies such as Mitsubishi, Panasonic, LG, Samsung, Toshiba, Trane, Lennox and Midea have developed their own versions of this technology and called them VRF or Variable refrigerant flow. The conventional multi split DX(direct expansion) system utilizes refrigerant as its cooling or heating medium. 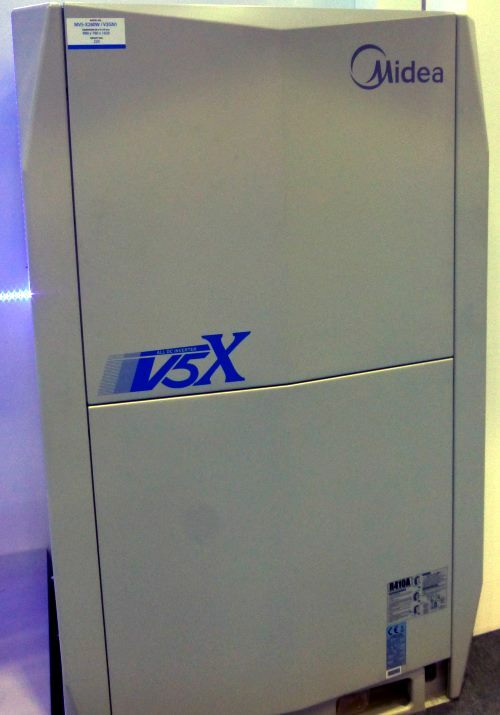 The basic multi split DX system consists of an outdoor unit where one or more compressors are housed and are connected to many indoor units. The compressors are usually ON/OFF type in that it can only on at a fixed speed rotation or totally off. The capacity can only be varied by running one or more compressors. This system is not efficient when running at a non-optimum load. For instance, if only one indoor fan coil unit calls for cooling, one compressor must be on to provide the cooling requirement and in this case, overcapacity occurred. Here are the overwhelming advantages of VRF compared to the conventional system described above. Most systems use DC inverter compressors to modulate the capacity by modulating the volume of refrigerant that is pumped by the compressor. These compressors are located on the outdoor unit and there are usually more than one compressors for higher capacity system. A combination of inverter and non-inverter compressors in the system are also available in some systems. In some design, a few outdoors can be connected together to provide greater capacity to the indoor units. The control algorithm is complex and powerful processors together with intelligent power modules are used to drive the compressors. The speed of the compressors can be step up or step down depending on the load requirements based on the saturation temperatures of the system. If higher load is required, the rotation will be higher. For example, if the compressors are designed to run from 50 Hz to 200 Hz with each step having a 10 Hz increment, there will be a total of 16 steps that the compressors can operate. By having this ability to vary the compression of the vapor at the compressors, this system will be more efficient even though the cooling or heating requirements changes frequently. Hence, a higher COP, EER, SEER and HSPF will be attained compared to the normal ON/OFF compressors. DC fan motors are also typically used in the outdoor as well as indoor units to control the speed of the fan. System efficiency and energy savings are further improved by varying the speed of these fans depending on the load requirements. Conventional permanent split capacitor fan motors which are used in normal system can only operate on a few speeds ex. ultra low, low, medium, high and super high. The configuration can be 2-pipe or 3-pipe systems. The 2-pipe systems can operate in heating or cooling mode but all the indoor units must operate in the same mode simultaneously. The 3-pipe systems have branch selector boxes which will enable the indoor units to operate in cooling and heating modes simultaneously. Here are some of this system configuration that you may encounter. Daikin invented this technology and continues to improve it with new launches. The VRV IV S series have smaller dimension and weight while maintaining the same capacity. In some design, the COP are much higher. For example, the VRV IV S Series 8 HP(22.4kW) outdoor unit is 14% lower in height, 29% lower in product weight and 58% reduction in footprint compared to the VRV IV. The 6HP COP increases by 12% to 3.86 compared to the VRV II S series. Daikin outdoor unit VRV IV. The VRV IV Heat Recovery Hot Water System recovers the heat generated by the air conditioning and use it to heat up the hot water for household use. Based on the specifications of Daikin, the hot water temperature of this system can go up to 65 °C (149 °F). This is done by coiling the high temperature and high pressure refrigerant pipe at the outdoor coil with the water pipe. The COP of a 6 HP heat recovery hot water system is higher at 4.5 compared to the heat rejection to the air at 4.41. Considerable energy saving is achieved as the electric heater will be less frequently used. All the units can be controlled through a central controller known as Intelligent touch Manager. This 10.4" LCD touch screen system is able to control up to 1024 indoor units and the ability to connect to BACnet building management system. The control of the VRV can also be done through the Smart Phones with iOS or Android operating systems by adding another control module and loading the apps. In this way, you can control every indoor unit of the house even when you are away. The Smart Phones can also be used as a remote control to control the units directly while you are in the house as long as the WiFi connection is available. Connecting to the building automation system through Modbus protocol can be achieved by adding a Home Automation Interface Adaptor to the system. Panasonic from Japan has developed the latest version of FSV EX ME2 variable refrigerant flow series with better features compared to the older versions. Here are some of the advantages. Energy saving is further achieved by having better COP. For instance, the 8 HP Cooling system has a COP of 5.30. The operating range of the system has been extended up to 52°C or 125°F, which means that it can still provide cooling even when the outside temperature is 52°C. Cooling operating range is from -10°C to 52°C(outdoor temperature) and heating range is from -25°C to 18°C(outdoor temperature). Low-noise operation is achieved by using better compressors, larger fan and better design. The 8 HP has an outdoor noise level of 53 dB(A). Multiple large-capacity all inverter compressors are used for capacity greater than 14 HP. Greater heat exchanger surface area with triple surface. 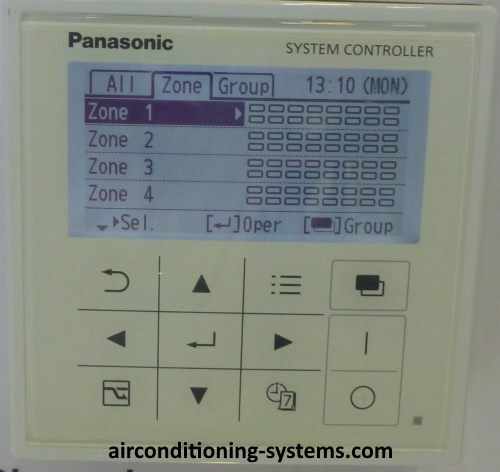 System Controller that can control all the units of the variable refrigerant flow system through this panel. Modern LCD individual controller, wireless remote controller and Centralized System Controller can be used in the system. Remote control through the internet can be enabled by using the Web Interface Systems. Lonworks Interface is also available for connection to the Lonworks Network. This all DC Inverter variable refrigerant flow system uses all DC inverter compressors, all DC fan motors and has an EER of 4.7 and COP of 5.6 for a 8 HP category. Typical features are as follows. Outdoor temperature heating mode operation from -20°C to 24°C and cooling mode from -5°C to 48 °C. Intelligent defrosting technology in which the time to defrost can be shortened to 4 minutes. Midea variable refrigerant flow outdoor unit. Rapid Warm Up and Cool Down Function enables the room temperature to be achieved faster. Protection functions such as phase, high and low voltage, ground, current, fan motor temperature, compressor overload, compressor temperature and pressure protection. Wireless remote control, wired controller and centralized controller. Building management system gateways to KNX, BACnet, LonWorks and Modbus by using additional modules to the networking bus.